Red-hot Rob Doran’s four goals in 19 minutes was the difference as Prescot Cables extended their unbeaten run to five matches with a 4-2 win over ten-man Harrogate Railway. The in-form striker squeezed a shot into the net after 21 minutes before heading in left wing crosses in the 23rd and 32nd minute to give The Tigers a commanding lead. Chris Ovington sneaked one in at the near post to hand Railway a lifeline, but Doran claimed his fourth with five minutes left of the half to make it 4-1 at the interval. Railway’s task was made harder in the 63rd minute when Harry Coates was shown a straight red card, though the ten men pulled together with Dan Barrett’s injury time finish giving the visitors reward for their efforts. Lee Ashforth made two changes from Monday night’s heavy defeat to league leaders Warrington Town; replacing Alex Low and Daniel Devine with Lawrance Hunter and Tom Owen. The contest started at a frantic pace with Owen almost capitalising on a Jonah O’Rielly mistake and Chandler Hallwood collecting Doran’s low shot. Railway had a strong penalty appeal turned down after 16 minutes when Hunter played in Ovington on the left only to be brought down by a Prescot defender, fairly according to the referee. Andy Paxton’s men began to take the ascendancy in the 20th minute when Lloyd Dean saw a stinging shot turned behind by Hallwood who was lucky not to be beaten from the following corner as Phil Bannister fluffed his lines at the far post. 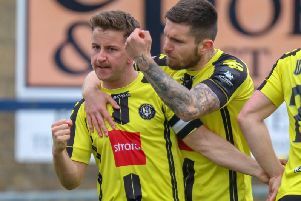 Cables then made their pressure pay when James Edgar rattled the bar from long range, allowing Doran to collect the rebound and drive the ball through bodies into the net. The striker wasted no time in claiming his 20th goal of the season two minutes later when he confidently headed a left wing cross into the corner. Owen had a powerful shot blocked just seconds after Railway went two behind, but it was soon three nil as Doran completed his eleven minute hat-trick. The third was almost a carbon copy of the striker’s second as Doran got enough power on his header from another left sided cross to beat Hallwood from close range. Three minutes later Railway found a response when, after a Railway free kick was pumped into the box, Rob Youhill cleverly found Ovington whose near post shot was fumbled into the side of his own net by Marcus Burgess. Two minutes after the goal, Hallwood reacted well to keep the score at 3-1, keeping out Edgar’s low drive with his feet. With five minutes until the half time whistle, Hallwood again saved from Edgar, but this time Doran was first to react to the loose ball and volleyed home. Railway’s boss made two changes at the break, replacing Luca Mellor and Charlie Clamp with Alex Low and Will Peers in the hope of getting back into the contest. The match continued in the same fashion though, as Lloyd Dean found himself with a free header six yards out only to be denied by Hallwood’s reaction save. The afternoon then took another bad turn for Ashforth’s men when Coates was shown a straight red card for denying a clear goalscoring opportunity when bringing down the through-on-goal Dean. Railway reacted positively to going a man down though, as Low smashed the crossbar with a sweetly struck half volley from the edge of the box. Barrett had been introduced prior to the hour mark and got in behind the Prescot defence soon after, only to poke a finish onto the roof of the net. The visitors went close again with 20 minutes to play when Ovington got on the end of Hunter’s cross only for Burgess to deny the attacker a second goal. Barrett then managed to put the ball in the back of the net only to look up and see the linesman had raised his flag to rule the goal out for offside. Ovington continued to threaten the Prescot goal, cutting inside and shooting into Burgess’ arms, while Edgar tried a couple of efforts from range but couldn’t hit the target. Deep into second half stoppage time Barrett’s efforts were rewarded when the striker ran clean through on goal and coolly rolled the ball to the ‘keeper’s left. There was just enough time for Prescot to kick off before the final whistle was blown to extend Cables unbeaten run to five and keep Railway inside the bottom two.